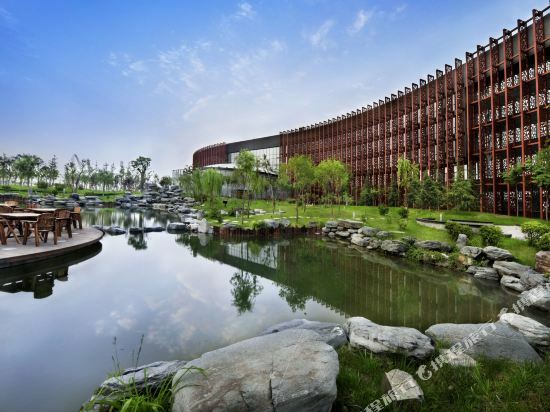 Newly opened in 2008, the Kempinski Hotel Xi'an (Xi'an Zhongxin Kaibinsiji Jiudian) is the official venue for the Euro-Asia Economic Forum and is located in Xi'an's Chanba Ecological Zone. This Xi'an hotel has various deluxe rooms equipped with broadband internet access, safes, and satellite TVs. For dining options, the Dragon Palace Restaurant with its 16 private rooms mainly offers authentic Shaanxi and Cantonese cuisines, while the Café Berlin serves international and regional cuisines, ending the list is the Kempi Deli. This Xi'an Kempinski hotel boasts of the state-of-art audio visual equipment and technology in its 1,400 square-meter pillarless ballroom, which also includes simultaneous interpretation and audiovisual systems. Ten other conference rooms of different sizes include the circular conference room on the fifth floor are available as well. Recreational facilities include KTV rooms, a sauna and a gym. If you want to stay in the best hotel in Xi'an, China, please come to Trip.com for a custom trip. Staying in exclusive Xi'an Jinjiang hotel Trip.com offers, you can fully relax and enjoy the stay in Xi'an and around Xi'an. All these Xi'an Jinjiang hotels lead in the industry in aspects of environment and recreation facilities, providing the best hotel service in Xi'an. To ensure that you can find the latest Jinjiang hotel in Xi'an, the latest hotel price as well as hotel facilities and indoor facilities information will be offered. In the meantime, detailed photos of Xi'an Jinjiang hotel will be displayed, making you know quickly whether hotel’s interior environment meets your taste. Besides, you can know specific location and reviews on Xi'an Jinjiang hotel from millions of users. If you want a nice room with limited budget, please filter through price and distance to get an appropriate Xi'an Jinjiang hotel. To ensure you can experience the best Xi'an Jinjiang hotel, users and we give a comprehensive rating on hotel, which gives useful help. Believe it or not, as the biggest online travel service company, we have the best service assurance and perfect users’ experience to meet your requirements in different aspects, no matter it’s Xi'an hotel or Xi'an Jinjiang hotel.